Hendersonville Muffler Company can absolutely repair your starter issue. This work would be a breath of fresh air from the crazy electrical problems, check engine light problems, engine replacements and the other crazy stuff that we see every day. Seriously though cars and trucks are absoulutely no fun if they won't start. We repair electrical problems every day. Hendersonville Muffler Company is really the only repair shop in Hendersonville, Tennessee that actually ADVERTISES to repair automotive electrical problems in Hendersonville. First and foremost if your starter isn't working you need to make sure that the battery and battery cables are connected correctly and are in good physical shape. Sad as it is in a survey a few years ago less than 15% of all of the technicians that were polled in a survey knew how to properly diagnose a battery cable which was 30% corroded internally. Bad battery cables and corroded battery terminals cause the starter to not get enough voltage because the battery never gets properly charged in the first place. Then there is the issue that cars and trucks today commonly last for 20 years or more and commonly achieve 200 -300,000 miles. Sometimes after starting the car a few thousand times the starter just dies. many shops jump on this and replace the starter at the first sign of problems. the new starter typically takes less energy to start the vehicle so a new starter may cure the car or truck... for a while. 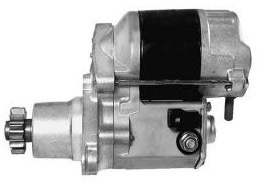 Starter replacement is one of the largest cause of tow-ins. The starting system looks so simple. The problem is that electricity cannot be SEEN with the human eye. I have watched technicians at the dealership who worked there for years and never really knew how to properly test the entire charging/ starting system. The technicians at Hendersonville Muffler Company can properly diagnose your entire starting/ charging system is less than 30 minutes and tell you exactly what is wrong with your vehicle. over 1/2 of the cars and trucks towed in for a no-start condition are actually cured for this price with no further parts needed. Give Hendersonville Muffler Company a call when your starter is not working. You will be glad that you did.